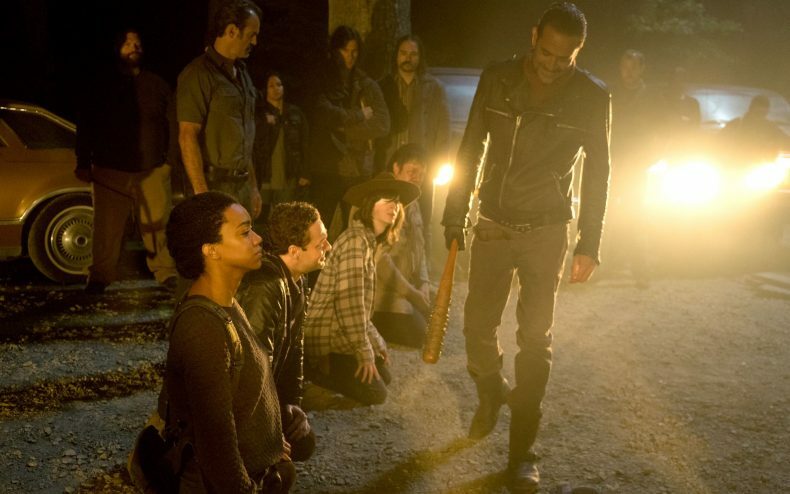 Last week Gale Anne Hurd told the press at the National Association of Television Program Executives conference that as a response to the negative backlash to the graphic violence in the Season 7 premiere of The Walking Dead, all future episodes had their bloody bits toned down. “We were able to look at the feedback on the level of violence…..we did tone it down for episodes we were still filming for later on in the season,” she claimed. But, uh, not so fast. Two other high-ups now say that isn’t true. Showrunner Scott Gimple told Entertainment Weekly that there had been no effort to cut violence from The Walking Dead lately — there was less violence, true, but that was just what the story called for. He also pointed out the show is rarely going to get as nasty-looking as Negan bashing Glenn’s eye out of its socket — because again, it was what the story called for at the time. Looks like it’s one word against another. Who do YOU believe?